Hezbollah observation posts on Lebanon border. New York, New York — June 23, 2017 … Israel’s Ambassador to the UN Danny Danon has presented a letter to the President of the UN Security Council H.E. Sacha Sergio Llorenty Soliz and to the UN Secretary General, demanding a strong and appropriate response to Hezbollah’s ongoing military buildup using the cover of civilian activities in southern Lebanon, in clear violation of UNSC resolutions 1701 and 1559. “These posts were erected under the guise of an agricultural NGO known as “Green Without Borders,” the activities of which are defined and at times funded by Hezbollah. “Such obstructions to UNIFIL’s operations in the area are unacceptable. These impediments prevent UNIFIL from fully executing its mandate to monitor the implementation of UNSC resolutions and maintain stability in the area. I should be grateful if you would have this letter distributed as an official document of the Security Council. I wish to inform you that an identical letter has been sent to H.E. Mr. António Guterres, Secretary-General of the United Nations. Please accept, Excellency, the assurance of my highest consideration. Hezbollah, also known as The Party of God, is an international Shi’a Muslim terrorist group fighting against Israel and “western imperialism” in Lebanon. The Iranian backed group does not recognize the legitimacy of the State of Israel and it has been labeled as a foreign terrorist organization (FTO) by the U.S. State Department since October 1997. 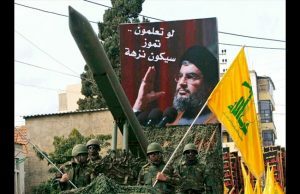 The US Department of Justice recently announced the arrest of two Hezbollah men, one in New York and another in Michigan, for allegedly plotting attacks in New York and the U.S. and Israeli embassies in Panama.